As Nelson Mandela said, “Education is the most powerful weapon which you can use to change the world.” On the same lines, we are coming up with a career counselling seminar and on spot evaluation in Delhi, to help students get a quality education in the leading Canadian university. The delegates from Mount Saint Vincent University (MSVU), Halifax are going to conduct it. To bring in your knowledge, MSVU is primarily a Public University that was established back in 1873. It is rated excellent in Graduate Employment Rate with 95.1% GER, and to your delight, it offers worth scholarships annually. The university offers undergraduate courses, research opportunities and diplomas in arts, science and professional studies. Having well-respect programs and departments, there’s something for every student at MSVU. The class sizes are kept small to concentrate on students more keeping in mind the high-quality standards set by the university. The university offers a four-year bachelor’s degree program in public relations. This is best for students who want to create a career in communications, marketing and sales profiles. 1st Canadian University to create a course in tourism and hospitality management. The Mount offers a variety of classes in the fall and winter terms and both summer sessions. 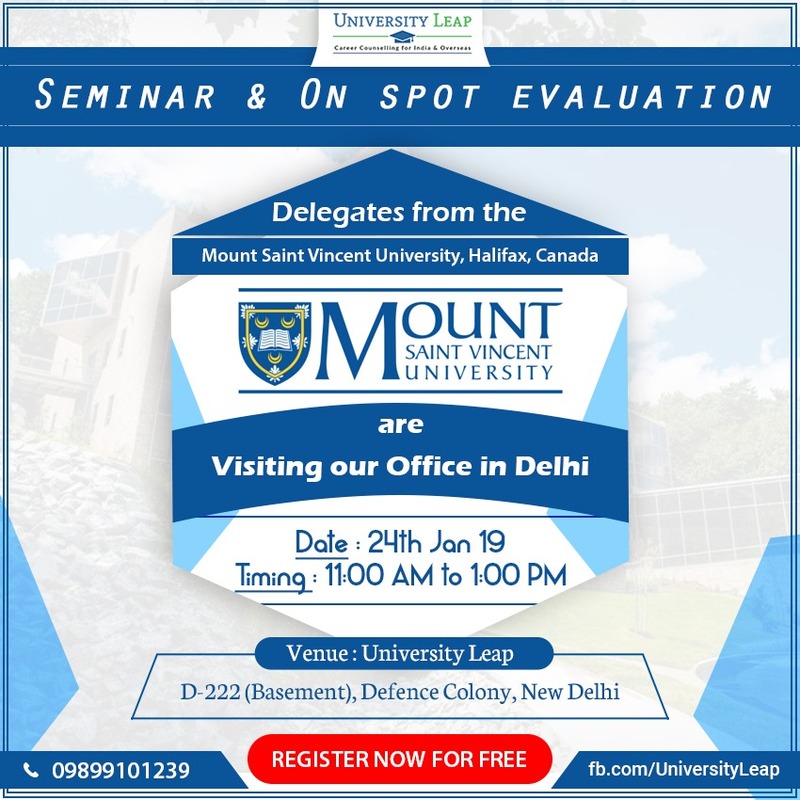 Learn more about the university and courses offered in the SEMINAR that shall be conducted in Delhi. If you’re looking for free career counselling in Delhi or Study in Canada assistance then this is a great opportunity for you. Make the most of it!